Villa Honeymoon has 1 bedrooom with splendid sea view, the accommodation is an open planned lounge/fully fitted.Bedroom: the bedroom is en-suite with shower and jacuzzi.Kitchen is equipped with washing machine, dish washer, fridge/freezer, oven/hob, kettle & toaster Sliding doors from the lounge lead onto a spacious, private pool area with dining table and chairs. tfacility. The villa is fully air-conditioned and offer multi channel television viewing.Details: Dining table for 4, 3 sunbeds,Sun umbrella, Swimming pool, BBQ Pool : 5 mt x 3 mt. Deep:1,50 mt. 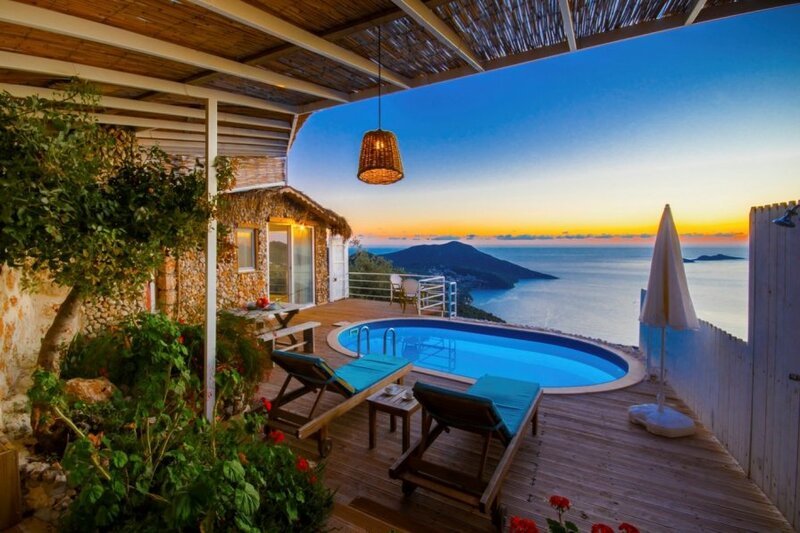 The villa is 2km away from Kalkan center and the beach: 5 min drive. The villa is cleaned weekly , towels and linens are changed once a week. Note : the villa has 60 steps of stair so espcially "old people" should watch their steps to avoide any physical damage,Check in :After 15.00 in the afternoonCheck out: Before 10.00 in the morningNote 2: Check in and Check out it can flexible according to availability villa. Please infor us about your arrival and departure time (Turkish time).if it is possible we can be flexible with these times for you..Note :Our property has a twin villa "honeymoon villa in Kiziltaş Kalkan: 143-1" so if you find one of them not availible you could check the second property or contact us to prove the availibility.